up to 99 saved fingers – approx. 3 s.
Connection cable connector strip for the Gira door communication system. 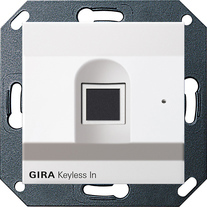 Keyless In devices can be connected to the Gira HomeServer using the DCS-IP gateway. This enables intelligent links. In this way, e.g. temporary or one-time access authorisation can be easily granted. All data including access authorisations can be managed centrally and flexibly using the Gira HomeServer. Children&apos;s fingers can generally first be reliably detected from 6 years of age.